As a space-saving fiber optic enclosure, the wall mount enclosure is popular with people around the globe. 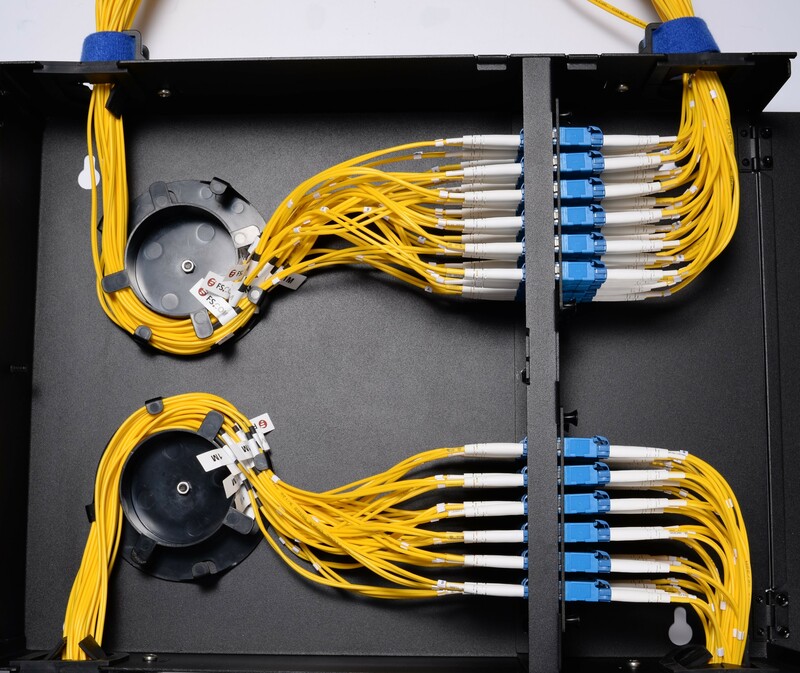 Except FHX fiber enclosure, FHD fiber enclosure is also our signature product to provide the essential interface between multiple fiber cables and optical equipment installed on the customer’s premises. To install it on the wall and to place the accessories in it may be a puzzle for some people. In the following part, I will make a illustrate to help you avoid the unnecessary triviality. FHD wall mount fiber patch panel comes with two separate compartments with two steel doors. As shown below, the left side is used for accommodating outside plant cables entering the building, pigtails and pigtail splices. Whereas the right side is designed for internal cable assembly networking that connected by fiber adapters or fiber optic cassettes. According to its capacity, the wall mount fiber enclosure can accomodate two or four adapter panels. 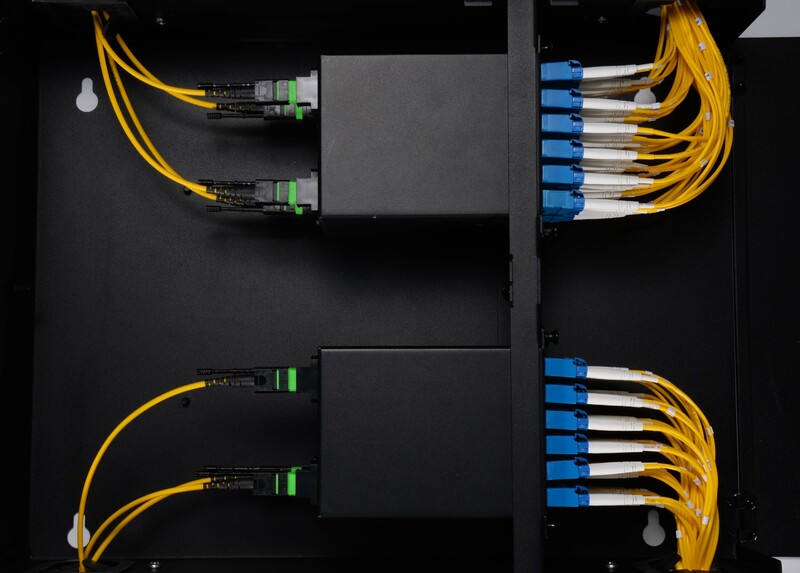 Start with a blank enclosure, after inserting the adapter panels, we may need spools ready on its place to manage the fiber slack. Take out both the covers on the slots of the adapter panels and the cables, and then couple them. Mark the slacks with number and strip them into a grommet for better protection. Use a strain relief brackets outside the enclosure to protect the cable. Take FHD MTP-LC cassette an example, the front side of it, 12 or 24 fiber connects are used to match with with LC or SC patch cables, while the rear side of it is to interconnect MTP backbone cabling. Since there are not many cables and yet enough space, the spools aren’t used here. The wall mount enclosure can be fixed quickly and easily to the wall using four screws.There are four key slots on the back of the enclosure for wall mounting. Make sure the size of the wall is large enough to hold the entire enclosure. And plan properly the optimum height, otherwise the equipment will be lower that people will bump on it when passing by or it will be too high that is beyond the users reach to complete the cabling. Fiber optic adapters are the critical part of fiber enclosure to accept the various fiber optic connectors. And MTP fiber optic cassettes are pre-terminated and pre-tested enclosed units. Whichever you choose is reasonable. In addition, the accessories mentioned above will be offered freely by FS.COM. And we have produced a short video about wall mount enclosure installation for your reference. Any question or suggestion form our esteemed customers will be sincerely considered. We really hope to grow better and be your best partner alongside you.